The National Sea Grant Program was established by the National Oceanic and Atmospheric Administration (NOAA) in 1966 to promote stewardship of coastal resources. By 1998, NOAA had initiated Sea Grant programs in all coastal and Great Lakes states with the exception of Pennsylvania. In March 1998, NOAA provided funding to Penn State Behrend, on behalf of Pennsylvania and Penn State University, to initiate a highly focused Sea Grant outreach project related to the Lake Erie coastline of Pennsylvania. 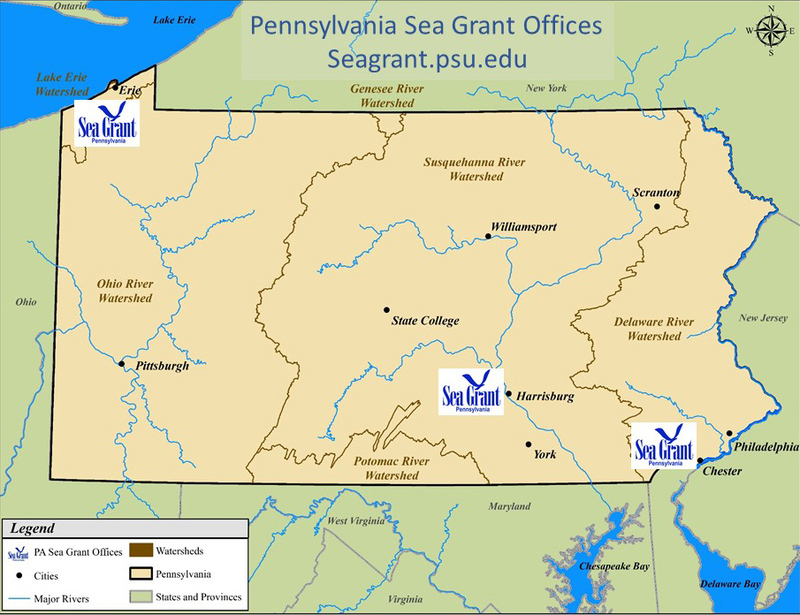 Based on Pennsylvania Sea Grant’s performance over its initial six years as an outreach project and the University’s reputation, in March 2004, National Sea Grant Office leadership determined that Penn State should lead the Sea Grant effort for Pennsylvania and Pennsylvania’s outreach project should be designated a Coherent Area Program, the next stage in the progression to College status. Lake Erie watershed consists of the northern half of Erie County and the northwest corner of Crawford County. Lake Erie’s 76.6-mile shoreline in Pennsylvania includes the 3,200-acre Presque Isle State Park and the 3,719-acre Presque Isle Bay. Delaware River watershed is home to approximately 5.25 million residents, and includes 112 miles of tidal Delaware River coast within Bucks, Philadelphia, and Delaware counties. The Delaware River is the world’s busiest freshwater port, supporting one of the world’s greatest concentrations of heavy industry and the second largest petrochemical refining center in the nation. Susquehanna River watershed is one of the largest watersheds in the Atlantic Slope of North America. In Pennsylvania, the Susquehanna River drains all or part of 43 of the 67 counties. The Susquehanna River is the largest tributary to the Chesapeake Bay, and provides half the flow to the upper bay while representing 43 percent of the drainage area. In summer 2009, again based on performance, the National Office designated Pennsylvania Sea Grant an Institutional Program, which included a broader statewide and regional mandate and an applied research program. This status brings Pennsylvania one-step closer to College status. Since becoming an Institutional Program, Pennsylvania Sea Grant, with input from local and statewide advisors and constituents, has expanded its leadership in three critical program areas: Healthy Coastal Ecosystems, Resilient Communities & Economies, and Education & Workforce Development. Within these areas, the program focuses on outreach, communication, and applied research. In addition, Pennsylvania’s location affords Pennsylvania Sea Grant the opportunity to coordinate activities with the Mid‐Atlantic and Great Lakes Sea Grant regions, as well as several U.S. Environmental Protection Agency and NOAA regions. In February 2014, Pennsylvania Sea Grant petitioned the National Sea Grant Office to begin the process for designation as a Sea Grant College. To this end, a NOAA team evaluated Pennsylvania Sea Grant in October 2014, the National Sea Grant Advisory Board approved the change in status in March 2015, and the U.S. Department of Commerce approved the change in September 2015. The National Sea Grant office recognized Pennsylvania Sea Grant as a full Sea Grant College Program in April 2016.